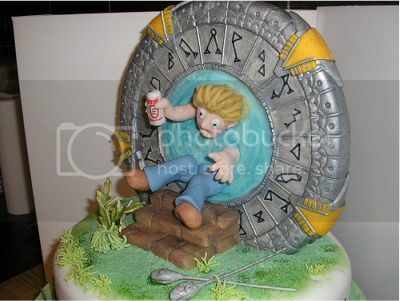 Julia of Cake Corner crafted this Stargate cake for the birthday of a fan of, you know… Stargate. Unlike Julia, I do not recommend Stargating while under the influence. * Leave it to the Brits to make a slang word for an alcoholic beverage sound like apple juice. Looks more to me like he fell into a giant toilet, and is being flushed! That would explain why he’s going in backwards. He was looking for a toilet and, being inebriated, dropped his pants and sat on a Stargate. Baal was NOT amused!